This charming villa is located in one of the most beautiful and panoramic areas along the Amalfi Coast. It is conveniently located between the two historical towns of Amalfi and Ravello, in a private and exclusive position, making it, a great starting point for easy day trips to all the tourist points of interest of the Amalfi Coast and Sorrento Coast as well as Naples, Vesuvius, Pompeii, Herculaneum, Paestum and the islands of Capri and Ischia. The house is two-stores high. (Interior 250 sq meters, 1000 sq. meters of outdoor area consisting of terraces and gardens). Entrance from the main road along the short private driveway. A enclosed garage, at the end of the driveway, provides parking for one car, there is additional parking for two cars along the driveway. 19 steps up to the main floor of the villa. Entrance is into a roomy and airy living room, with open fireplace and panoramic sea view terrace. The kitchen can be reached from the living room but also from the terrace, making it easy and pleasant to organize outdoor meals. The kitchen has also a door leading to a second terrace situated in a delightful angle, surrounded by pine trees and a mature violet bougainvillea. Next to the kitchen is the elevator. Double bed, En-suite shower room, Air conditioning/Heating available, TV, terraces sea views. Reached either through the indoor staircase (20 steps) or the lift. Double bed, En-suite bathroom with bath, hydro massage tub and separate shower cubicle, Air conditioning/Heating available, TV, Sea view. Double bed, Air conditioning/Heating available, TV, terrace Sea view. Twin beds, Air conditioning/Heating available, TV, terrace Sea view. With a modern stall shower. From ground and upper floor, the lift takes you to a spacious terrace (reached also from the entrance of the villa with an external stairway of 45 steps) with terracotta floor, decorated with large terracotta pots overflowing with geraniums. A stairway of 21 steps takes you to the upper level with a huge terrace which provides spectacular views of the coast and the sea and comfortable and furnished outdoor spaces. It houses a large swimming pool (16 x 7 meters, open from May to October), 2 outdoor showers, deck chairs, shaded dining area with table and charcoal barbecue and in a corner the bar area. Services - Beach: 1 Km. (Atrani or Castiglione) - Restaurants, Bar and Grocery shop 1 Km. - Bus Stop 100 m. - Motorway 20 Km. Cites - Atrani centre: 1 Km. - Ravello: 4,5 Km. 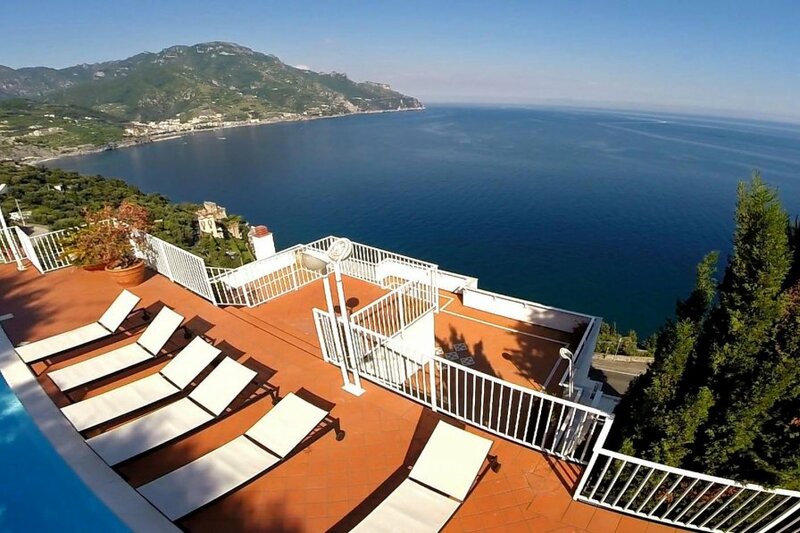 - Amalfi: 2 Km. - Positano: 20,5 Km. - Sorrento: 33 Km. - Salerno: 25 Km. - Napoli: 60 Km. - Roma: 277 Km. Attractions - Pompei Excavations: 37 Km. - Paestum Excavations: 71 Km. - Vesuvius Crater: 59 Km. - Capri Island: connected from the port of Amalfi 2 Km. Airports - Naples Capodichino - 65 Km. - Roma Leonardo da Vinci 288 Km. - Roma Ciampino 261 Km. - Bari 255 Km. Railway Stations - Salerno - 26 Km. - Sorrento 34 Km. Check-in time is between 4,00 and 8,00 p.m., from Monday to Saturday. You will be met and taken to the booked accommodation, asked for a photo copy of your Id or passport, any extras and the Breakage deposit (in cash only in any currencies) € 1.500,00 – this is refunded on your departure day, less any breakages. Check-out time is between 07:00 a.m. and 10:00 a.m., from Monday to Saturday. On departure the property has to be left tidy, with the kitchen clean and free from trash. Should these conditions not be respected, there will a deduction from the deposit - amount corresponding to the extra cleaning time. Arrival and departure times can be arranged outside these times or Sunday, for this service a supplement of € 55,00 is applied. City tax: Mandatory, is € 5,00 per person, per day, payable locally in cash. Baby Cot and Highchair (with linen) € 55,00 per week payable locally.